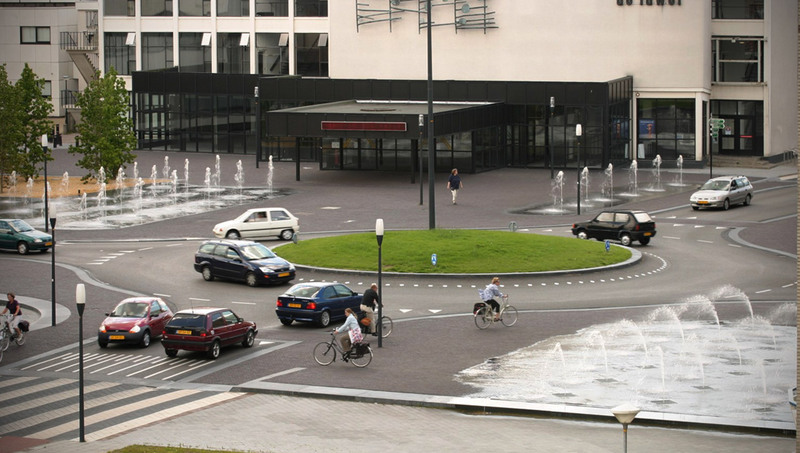 The Naked Street sounds like a rather questionable reality television show, but in fact it was a fairly famous experiment in urban planning and traffic safety, pioneered by a Dutch gentleman by the name of Hans Monderman. Across Europe, 400 different cities adopted Monderman’s concept after seeing how successful it was and boy did it pay off, as those cities saw a drastic drop in urban road accidents. Monderman was so certain of the validity of his ideas that he would step backwards into traffic to prove them correct. He died in his bed in 2008. The concept of the naked street is actually fairly simple. You remove all of the signage, road markings, speed limits, traffic lights, pedestrian crossings, lane markers and even curbs, and put the responsibility for the safety of pedestrians into the hands of the drivers. By making drivers responsible for governing their own behavior, and by removing the distractions on the road, the rate of accidents fell drastically in the urban areas where this practice of “Shared Space” was introduced. The lack of guidance meant that drivers felt less secure, which in turn led to drivers moderating their own behavior and becoming more mindful of pedestrians. Traffic speeds dropped drastically as they began adapting to the road conditions rather than trying to match the posted speed limits. When you treat people like idiots, they’ll behave like idiots. In countries where there are no laws enforcing the use of helmets, there are fewer motorcycle accidents. When Nixon’s federal speed limit was abolished in 1995, the American State of Montana failed to place their own speed limits outside of urban centers and saw no increase in fatal accidents. The number of accidents involving cyclists on roads actually increase significantly when they are given a designated cycle lane. Traffic flow consistently improves in cities when power-cuts or technical problems turn off the traffic lights. A study from the city planners in Boulder, Colorado found that their favoured traffic calming measure – speedbumps – prevented ambulances from reaching people in time; creating a ratio of 80 lives lost to every 1 that the bumps saved. Who has the right of way? I don’t care. People here have to find their own way, negotiate for themselves, use their own brains. 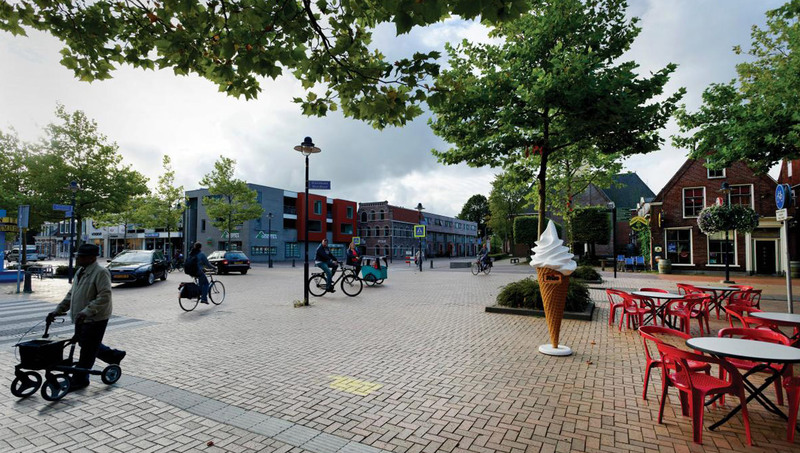 The incredible success of Naked Streets have now spread across the globe and it is impossible to deny the results that they have produced, but the implications for the wider world of design still haven’t been considered. So much of modern UX design has grown from UI design, where the goal was to guide the user as quickly as possible to the correct function. To take the user from the first point of contact along a well sign-posted journey to the designers’ intended end-point. Experience Design would be very different if it was built around Monderman’s ideas, with the most minimalist of guidance and an open invitation for the user to explore the space and find the way themselves. The delight of discovery has always been a cornerstone of good design, and by making every moment a new discovery, these open designs could open up a world of opportunities. There would certainly be a learning curve and some uncertainty, just as there was in the Naked Streets, but in the end personal exploration could give a user a more intuitive grasp of the system being presented to them. Monderman’s ideas for city planning have been carried on by a new generation of true believers and he has been widely praised in the press, but his ideas still seem to be having trouble making headway in the mainstream. Perhaps when we see more widespread acceptance of Naked Streets, we will get to see more of the same concepts rippling over into Design Thinking too. Trained psychologist and anthropologist, interaction designer, product designer and Fellow of the Royal Society of Arts: there are many strings to Owen’s bow. His endless fascination with human behavior and 25 years in the industry make him ideally placed to advise our clients on everything from service propositions to digital transformation. Owen inspires and leads our global design group and creative teams, also serving as non-executive director on various startups and advisory committees.